In times of ever increasing networking and more complex change processes, the control of group processes is and remains a key factor for the success of organizations and companies. Whether in line management, in a project or in a complex change process, the participation of employees and other interest groups is more important today than ever before. Failure to involve employees at the right points nowadays not only robs the company of an opportunity for good solutions and binding implementation, but also deals it a bad hand in the war for talent. This is because participatory management is not only desirable these days, but expected. But how can participation work without jeopardising organizational agility? How can complex decisions be made when so many have a say? How can I ensure that responsibility is not transferred to all, but stays where it belongs? 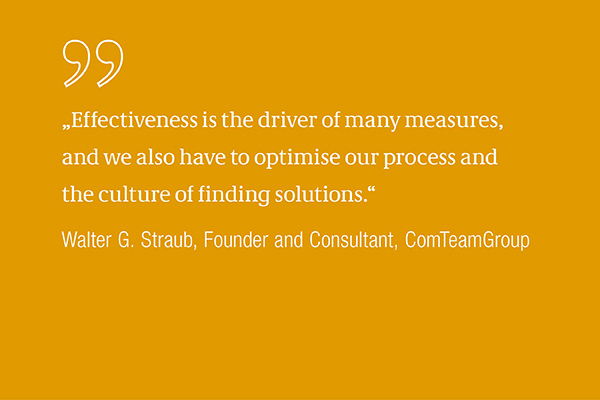 Anyone who wants to design group processes efficiently faces these challenges. To this end, ComTeam moderation provides a thought model that includes the feelings and views of everyone involved, makes decision-making transparent and thus facilitates solutions that are not only good in terms of content, but can also be subsequently implemented. Workshops, meetings and closed-door sessions become more efficient and the productivity of the organization increases. ComTeam moderation also supports a working culture that facilitates viable decisions, transparency about differing and jointly held views and resolution of conflicts. This working culture increases both the freedom of design and the self-responsibility of the parties involved. 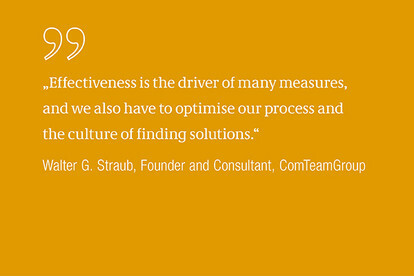 ComTeam has been dealing for over 40 years with the issue of what makes group processes effective and efficient, and what is required for binding implementation of the results produced. The demands on the moderation method and the role of moderator have been constantly changing over this time. We have continuously adapted ComTeam moderation to these new requirements and developed a procedure that permits extremely flexible use and succeeds in cases of doubt even against the odds. ComTeam is familiar with all forms of moderating and supporting closed-door sessions, team workshops, events, forums and meetings – whether with five or 500 participants. 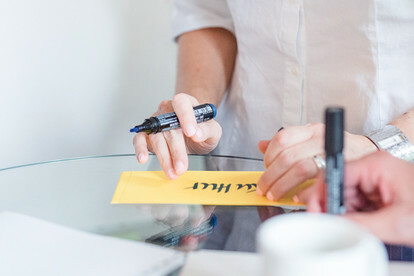 Designing and moderating events is a core business for consultants. 150 leaders meet twice a year to deal with strategic issues and leadership culture. The event is built on a framework of individual event elements. In advance there are preparatory meetings with the members of the Board of Directors, the conference team and individual key players. Twice a year, a departmental manager withdraws from the everyday working environment with the next management level. On the one hand, he/she wants to discuss and advance conceptual, important topics; on the other, however, he/she also wants to reflect on the current cooperation in the management team. Two divisions have been combined. The issue is about coming into contact with each other regarding mutual expectations, issues of work organization and forms of working together, as well as the orientation of the new unit. What is important is starting the process of finding a common identity and thus a new sense of togetherness. The preliminary discussion has taken place, the project manager has sorted through the findings and derived the first approach concepts from them. The project manager now ensures that the initial situation, the objectives and the approach are worked on by a wider group with the clients, parties involved and doers. The task has been agreed by the core team and the road map and objectives for the overall process have been formulated. What now follows is the step into the relevant organizational public. This involves working on, designing and discussing the change process with the relevant stakeholders. Die Arbeits- oder Projektteams bearbeiten ihre Arbeitspakete, es werden Analysen durchgeführt, KriteriThe working or project teams work on their work packages, analyses are conducted, criteria defined, alternatives discussed and the first steering group meetings are imminent. This is the time to get relevant stakeholders and groups involved in developing solutions.